Be the first to share your favorite memory, photo or story of Myrna. This memorial page is dedicated for family, friends and future generations to celebrate the life of their loved one. 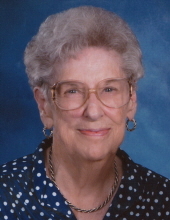 Myrna Lou Mercer Hardiman passed away on July 1, 2017 at her home in Blackwell. A graveside ceremony for Myrna will be held on Wednesday, July 5, 2017 at 2:00 p.m. at the Mount Olive Cemetery in Nardin, Oklahoma. Myrna was born on September 20, 1930 on a farm west of Blackwell to her parents, Stanton Edward Mercer and Ethel Marie (Diemer) Mercer. She met and married Ernest Newton Hardiman on October 29, 1949. They moved to a farm east of Bramen, Oklahoma and lived and farmed there for 11 years. Before they moved into the town of Blackwell, Earnest began working for Dave Morgan Oil Company. They bought their house in 1963 and lived there until her death. Myrna was a homemaker and belonged to the Vernon H.O.A. Club for over 40 years. After the couple moved to town, she belonged to the First Christian Church and she was a Sunday School Teacher and worked in the nursery for many years. She was preceded in death by her parents, two infant daughters, Vicky Lynn Hardiman and Christie Lea Hardiman, and her husband of over 60 years, Ernest Hardiman. To send flowers or a remembrance gift to the family of Myrna Lou Hardiman, please visit our Tribute Store. "Email Address" would like to share the life celebration of Myrna Lou Hardiman. Click on the "link" to go to share a favorite memory or leave a condolence message for the family.